HpUI.exe is a malicious process related to several browser hijackers. For example, it is a part of iStartSurf and iStart123 hijackers, of which we wrote special removal instructions before. The most typical location for HpUI.exe is a special SupTab folder in the Program Files directory of your computer. 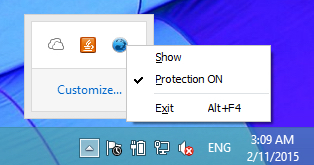 The alternative name for HpUI.exe is Search Protect. This guide will help you to stop HpUI.exe and remove Search Protect, and even the entire SupTab folder (full of malware) automatically. HpUI.exe process, which is a component of Search Protect potentially unwanted program, has the only thing in mind – to prevent you from removing iStart123.com, iStartSurf and other browser hijackers. In other words, if you don’t remove HpUI.exe (Search Protect) in the first place, you will not be able to completely get rid of these annoying browser hijackers from Google Chrome, Mozilla Firefox and Internet Explorer. 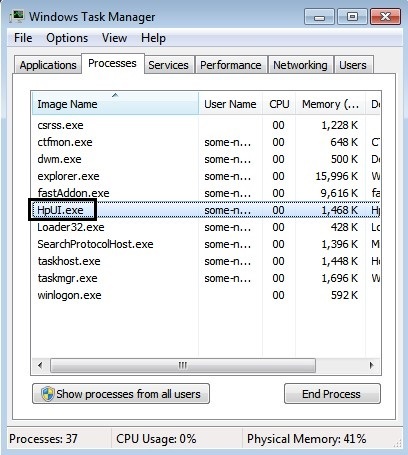 It is obvious that you need to remove HpUI.exe, Search Protect and the entire SupTab folder in the “Program Files” directory of your computer. 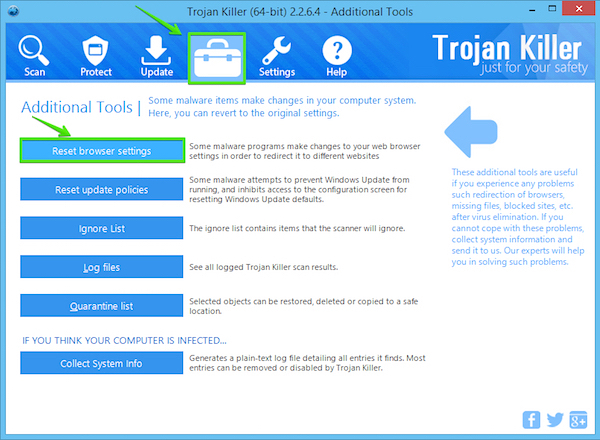 To do it effectively you need to scan your computer with one or even several anti-malware programs, which are supposed to end the running task of HpUI.exe, all related processes like Loader32.exe, Loader64.exe, and then to remove all malicious files and registry entries related to this malware and browser hijackers. 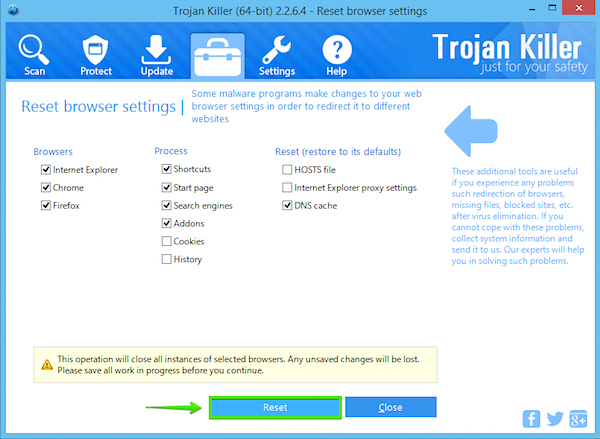 We recommend that you remove these browser hijackers, HpUI.exe (Search Protect) and other malicious programs in an automatic way, which is explained in this guide below. Also, consider purchasing the professional version of this recommended software that will help you to prevent your system from being infected with all sorts of useless applications in the future. In other words, this will avoid malware intrusion attempts ahead of time. IMPORTANT NOTICE before you download! GridinSoft Trojan Killer is a shareware application. Its 15-day free trial is only able to remove 2 (two) infected items for free. In case your system is seriously infected payment must be made for its full registered version, which will remove all threats identified during the scan of your computer. If your computer requires a powerful real-time protection from GridinSoft Trojan Killer to prevent your computer from being infected with HpUI.exe and similar browser hijackers in the future, payment needs to be made for its license key after 15 days of its free trial expire. If you would like to extend the duration of free trial period of GridinSoft Trojan Killer and the limit of infected items to be removed during this free trial, please create the support ticket by going to this online form. We will give you a personal temporary license key to evaluate GridinSoft Trojan Killer and will send it to you by email, hoping that you will seriously consider purchasing its full version for ultimate antimalware protection. 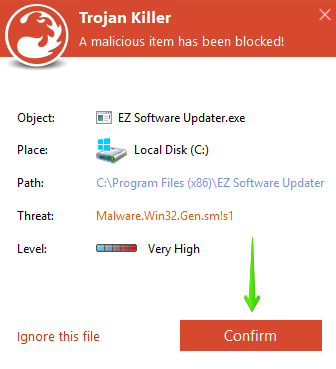 How to prevent your PC from being infected with HpUI.exe and similar browser hijackers using GridinSoft Trojan Killer.